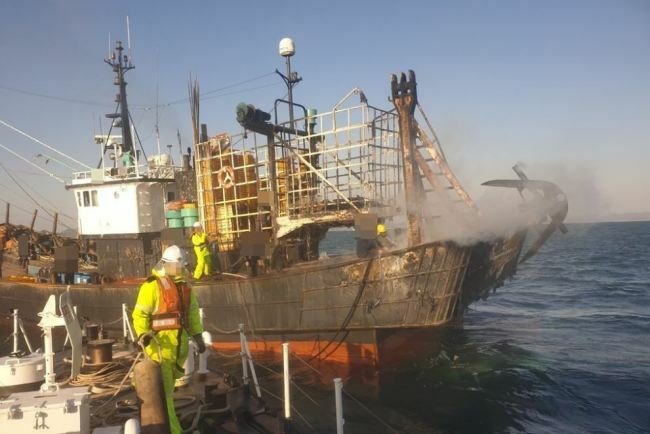 Two foreign sailors went missing and another was injured after a fishing boat caught fire in waters off the southwestern coast Thursday, authorities said. The 85-ton vessel carrying 12 crewmen caught fire in the sea off about 6.4 kilometers northeast of Narodo, an island in Goheung county, South Jeolla Province, at around 8:25 a.m., the Coast Guard said. Narodo is located about 330 kilometers south of Seoul. A 29-year-old Chinese national and a Vietnamese, aged 23, remain unaccounted for. They are believed to have jumped off the boat right after the fire broke out. A search is under way to find them. Another Vietnamese sailor suffered burns and was sent to a hospital.